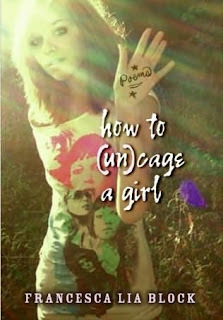 If you were ever a young girl, growing up through adolescence, this book is for you. Francesca Lia Block lyrically address the ups and downs of being a teenager, and the things that we think about at that age. Some lives are broken, and some lives glitter, but every girl should know they have a voice. This book is one voice among the masses. If you adore Francesca, you know this has to be fantastic. I think this is a great little book to give as a gift, for yourself or for that young girl in your life. "i thought my teacher was a nazi"
My favourite author! Weetzie Bat has been my favourite book since high school. I didn't even know this was out. Francesca Lia Block + poetry???? I have to read this!!! I've read a book by this author before and I'm not sure I liked it much. This one sounds way good though, so I will check it out :) Great review!